Hakone-town, Odawara-city of Kanagawa Prefecture in Japan, is known as "Japanese Puzzle Box(Himitsu Bako)". It is one of the woodwork handed down from old times. The origin goes back even to the Meiji era(1868〜). If the whole surface of a square box or a part is moved in order, the lid opens.With this mechanism, it is truly a puzzle. The operation which moves the whole surface is counted as 1,and a name is decided by the number of counts taken to arrive at the final lid. Morever, the length of the longest parel is measured, then this measurement is placed in front of the name. Note: 1-sun is 3cm.Moreover, they are Hakone-cho and the Odawara district as that with which trickbox is decorated.Furthermore, the trickbox is decorated with traditional Hakone-cho, Odawara district artwork.The mosaic(Yosegi) and wood inlaid work(Zogan) a traditional handicraft are used.In this case, the marquetry and wood inlaid work serves as the pattern for the box; and it is thinly sliced and pasted on the box. This pattern also to maintain proper function of the trickbox.The decorative paper not only enhances the aesthetics of the trick box, but also serves asprotection.The trickbox, with its advanced technological aspects, requires preservance to manufacture. Despite its intellectually fascinating design and function, the trickbox is anything but mechanical.The feel and sound by which the tree runs are simple and gentle. 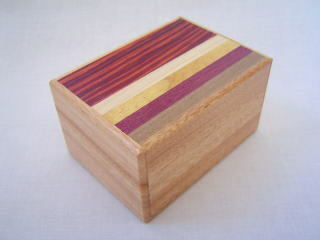 This is the charm of the Japanese Puzzle Box! 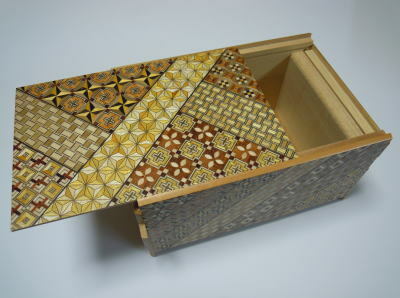 Japanese Wood Mosaic works are manufactured in Odawara,Hakone JAPAN. In the latter Edo period,or about 200 years ago, a craftsman in Hakone established the present wood mosaic skill. In the Meij era(1868~), Wood mosaic craftspeople devised intricate patterns and manufactured a wider variety of wood mosaic articles.Natural colored wood materials are assembled together into a board with a beautiful mosaic pattern. 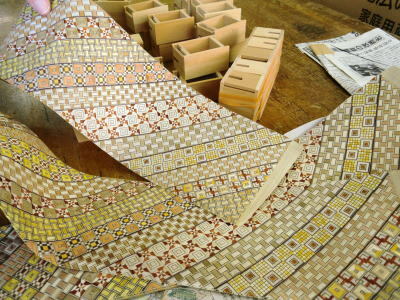 and sheets of this board are pasted to boxes for decoration.also a plain wood mosaic block is processed into a products. There are 60 different mosaic patterns. 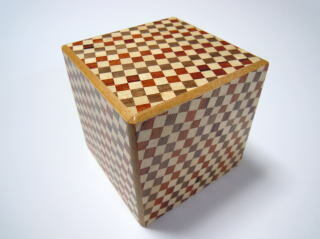 Japanese wood mosaic is called "Yosegi" in Japanese .